I cannot believe I am saying this. But bunk beds have been life changing in our house. Yes. LIFE CHANGING. In fact, I’m still pinching myself. It’s been three weeks of Hudson and Sadie sleeping ALL NIGHT LONG in their magical bunk bed…and I still can’t get over it. 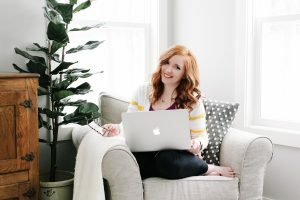 So today I’m answering all of your bunk bed questions and spilling the beans about what worked for us! First, a little back story: Hudson was a great sleeper until he was about 2 and a half. At that time, I was hugely pregnant with Sadie so we transitioned him out of his crib (which he slept great in) and in to a twin size bed. That he could get out of. So he did. Over and over. I remember almost breaking down in tears with our pediatrician about it. Because I would have to sit outside of his room and put him back in his bed. At least 40 times. And I was soooo pregnant and emotional. It was rough. Somehow we finally got him to sleep in his bed, but he would wake up at least once at night and cry for me. Then, I had Sadie, and we sold our house, moved in with my mom, and then finally moved in to our current house. It was a lot of transitions for him (and us) and I know he ended up in our bed frequently. But once we moved in to our current house, he started waking up crying and saying he was scared at night. So I would have to stay with him in his room until he fell asleep. And, like clockwork, he would wake up in the middle of the night, come down the stairs, and climb in to our bed. Sadie was 6 months old and sleep was so valuable for us….so that became our routine. I came to terms with it, and knew one day he would grow out of it. THREE YEARS LATER it was still happening. Meanwhile, Sadie has always been our good sleeper. She slept in her crib all night and never once tried to climb out….for three years and 5 months! (read about that here) She gets a gold star for sleeping, that’s for sure. 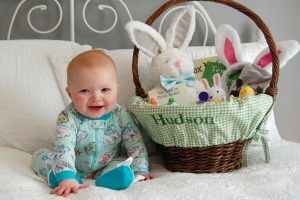 But she started asking when she was going to get to sleep in a big kid bed, and I knew once she did that she might realize Hudson was sneaking in to our bed, and then we would have TWO kids in bed with us. So I knew we had to do SOMETHING! But what? Both my mom and Jon brought up bunk beds. And initially I turned my nose up at the idea. I’m not exactly sure why, but I think it’s because in my mind, bunking the kids meant them sharing a room. And Sadie’s room was pink and perfectly her. 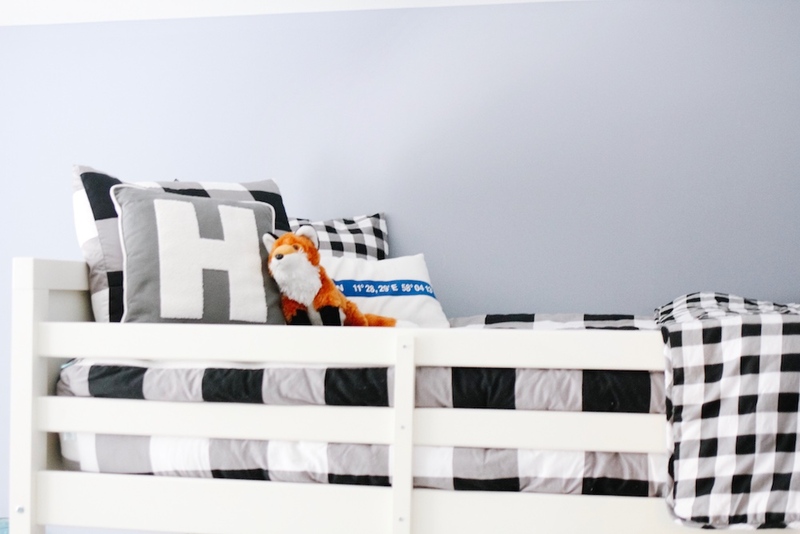 And Hudson’s room was such a boy room….I didn’t want to combine all their stuff and come up with a gender neutral space. Until I realized that I didn’t have to do that AT ALL! After all, it is MY house. I can do whatever I want. I remember growing up my best friend lived across the street from me and she had a little brother and a little sister. And all three of them slept in her brother’s room, even though they each had their own room. They just wanted to be together. And I thought they were crazy! But now, I TOTALLY GET IT. Hudson and Sadie like being together and could potentially help each other sleep through the night. Hudson would have Sadie so he wouldn’t be scared, and Sadie would have Hudson to teach her how to sleep in a big kid bed. Totally a “two birds with one stone” type of situation. 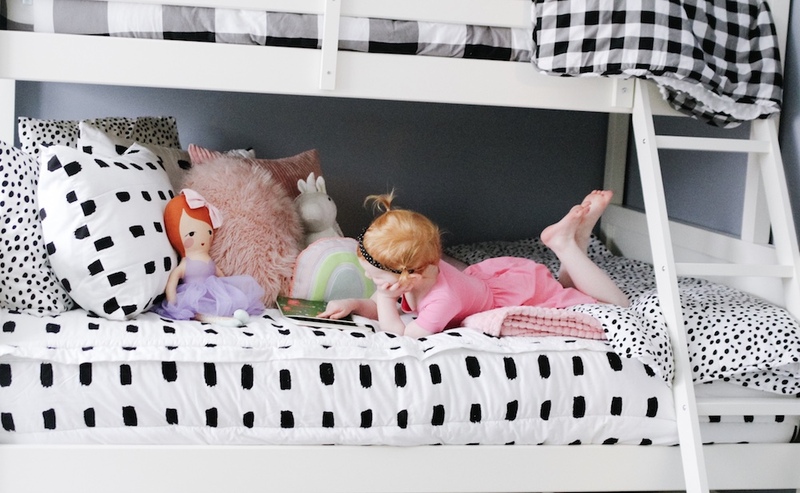 It finally clicked in my mind that they could bunk together in Hudson’s room, but Sadie could still have her girly pink room to play in and store all her stuff. I think there are a lot of cute boy-girl rooms….so I’m not bashing that idea! It just wasn’t for me! So I finally realized it doesn’t matter where they sleep, as long as it’s not with me! I quickly bought a bunk bed and the most amazing bedding ever, came up with a game plan, crossed my fingers, and bribed the you-know-what out of my kids. Yup. I am not above a little bribing mixed with a dash of threatening. Make it Sound Awesome: We bought up the idea of bunk beds to the kids and they were SO excited. I can’t say that I blame them, bunk beds are pretty cool! I told Hudson that Sadie could sleep in his room with him so that he wouldn’t be scared. And that he would be “in charge” of teaching her how to sleep in a big kid bed. He totally ate that up! I also kept telling Hudson and Sadie things like “Wow! Your bed is so cozy! Look how soft it is! You sure are lucky to get to sleep in a bunk bed!”….that kind of stuff. The Bed: We ordered this twin over full bunk bed and this mattress. We wanted Hudson to have the option of either sleeping on the top bunk or sleeping on the bottom with Sadie if he was scared. We also knew that in a few years, the littlest sister, Belle, might want to sleep with the big kids too, and she could sleep with Sadie on the bottom. We thought about getting one with a trundle underneath but it just seemed like a lot, so we didn’t. 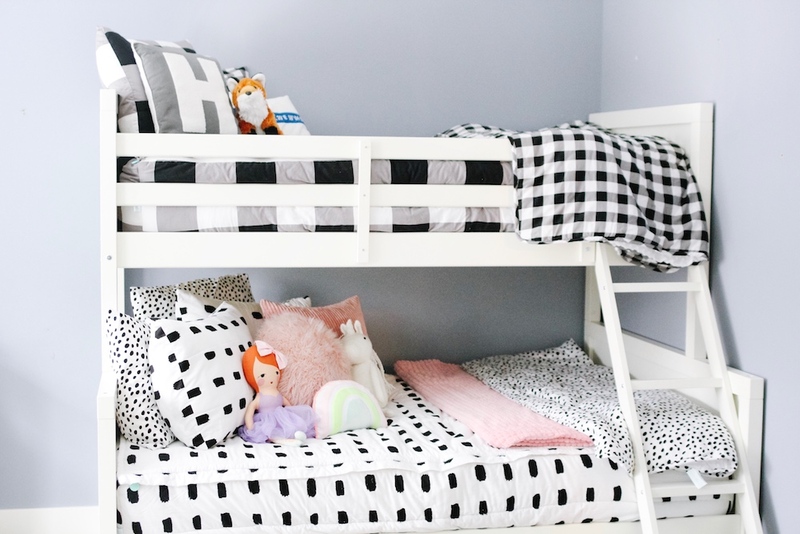 We love this bunk too because it can also turn in to a single twin and single full bed. Which is where the “threatening” I mentioned comes in to play. When we were building the bunk bed I made sure the kids understood it was two separate beds. And that if they couldn’t sleep in them all night long then I would take them down and make them plain boring beds again. And my threats totally worked. One side note about this bed…it’s SO great for the price! Totally sturdy enough for me to get on the top. Now, it’s not Pottery Barn quality. But it wasn’t a PB price either. I would buy it again in a heartbeat. And another unexpected bonus of having a bigger bed on the bottom is that I can easily stand on the bottom bed to help Hudson make his bed, tuck him in, give him a kiss etc. 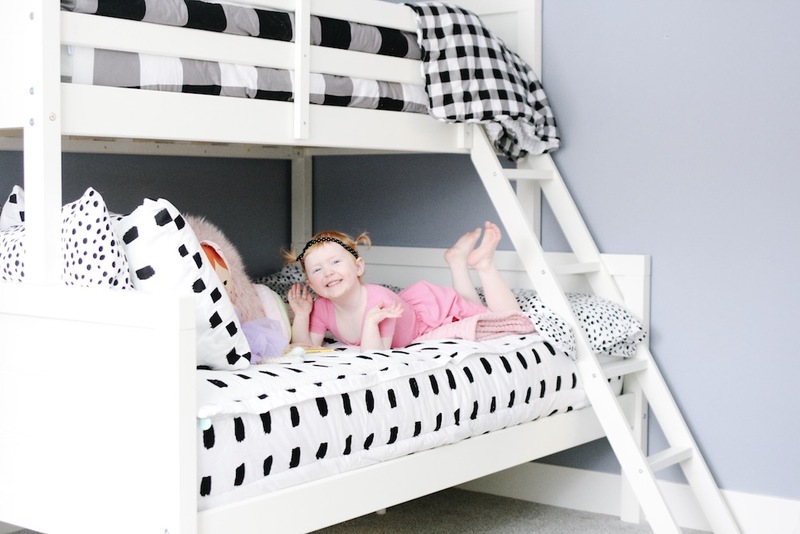 It has a eliminated a lot of the issues I think are often associated with bunk beds. I just step on Sadie’s bed! 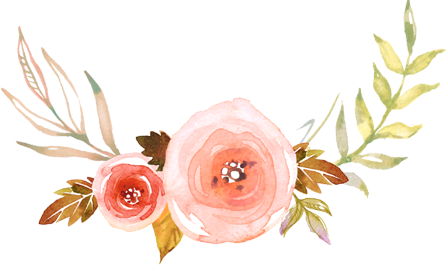 The Bedding: I had heard about Beddy’s before from other bloggers, but I didn’t quite understand what they were. 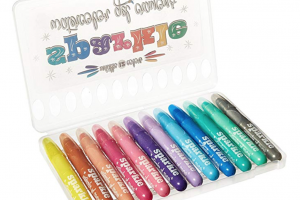 And let me tell you…..if you have bunk beds (or even just kids in regular beds) you NEED these! Total game changer. Basically when you purchase a Beddy you receive everything you need to make up a bed….and the best part is you zip it up! Yes! Zip up your bed! Genius! The bottom piece has elastic and slips over your mattress just like a fitted sheet. The sides feel like a comforter and the part you sleep on is sheet material. 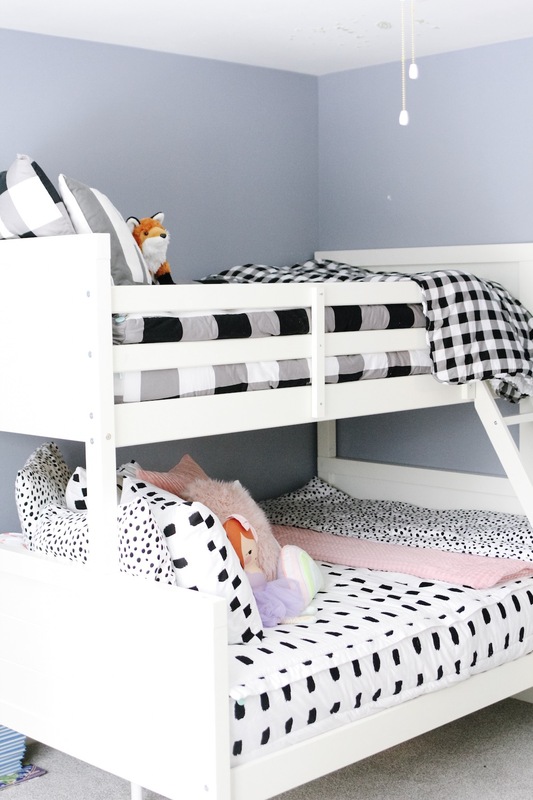 Then you zip up your bed…so no more tucking and messily made beds! It’s fool proof and even Sadie, who is three, can make her bed. There isn’t a “top sheet” it’s just a comforter material with a soft minky fabric inside. It has simplified our beds SO much without compromising on style. 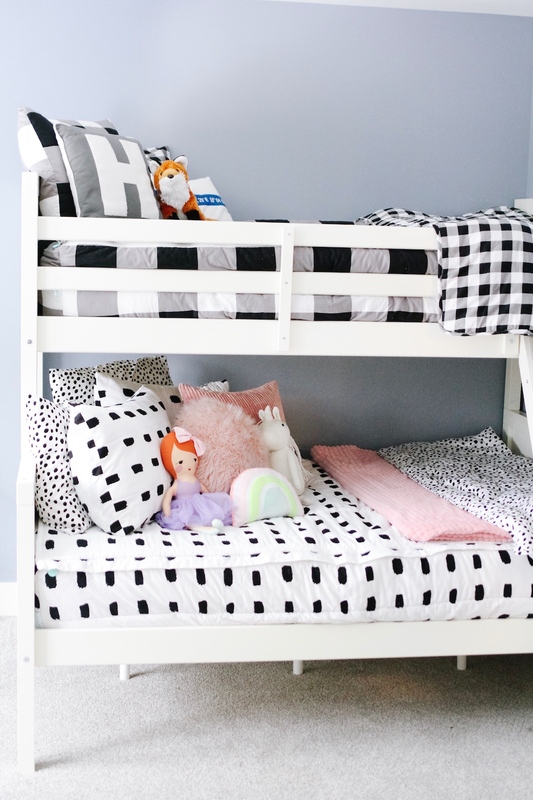 I think especially with bunk beds, bedding can get sloppy looking fast, fall off, and just be a pain to make up. Beddy’s eliminates all of that hassle! Hudson LOVES his Beddy’s and thinks it’s the coziest bed ever. We also received Beddy’s blankets for the end of their beds for those extra cold Michigan winter nights, but so far both kids have been warm enough without them. I love how they complete the look. I picked the Checked Out set for Hudson and it coordinates so nicely with Sadie’s Dash set. I just LOVE that I can style them easily for a boy and a girl, yet they still look cute together. I also love that the zippers are large, super sturdy, and don’t get caught on the fabric like you might expect them to. 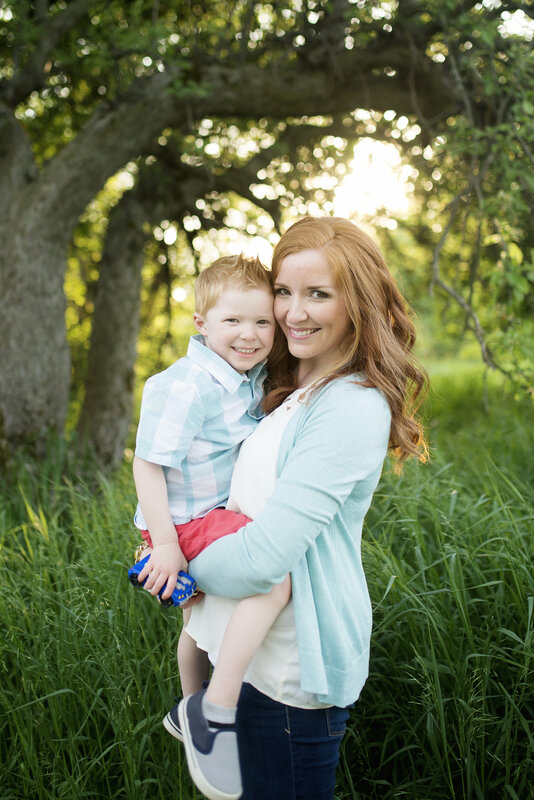 Bribes and rewards: As I mentioned before, I am not above bribing my kids. After all, we’ve struggled for over three years with Hudson sleeping all night. So I was ALL IN to make this bunk bed thing work. I took Hudson and Sadie to Target and let them pick out one “sleep all night” toy. They both picked this in pink and blue. The deal was if they slept all night in their bunk bed then they could have the toy in the morning. Nothing motivates my kids more than seeing a toy and knowing they can’t have it until they do what I want them to do. Sleep All Night Chart: Next, I made a sleep chart. Nothing fancy, just some paper and a ruler and some lines. 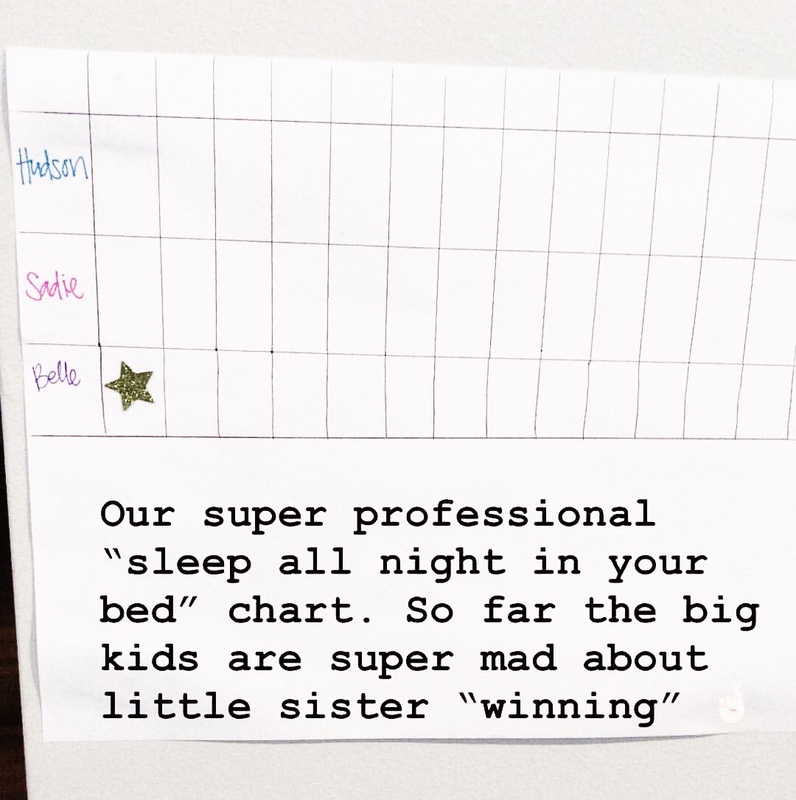 I found some gold sparkly star stickers and explained that for every night they slept all night in their beds, they could add a star to their chart. Once they filled it up, we would go back to Target and pick out another toy. I decided last minute to throw Belle’s name on the chart too. I mean, she is a pretty good sleeper, so if all else failed, seeing her rack up the stars might motivate my ultra-competitive Hudson. Spoiler alert, it sure did! Okay to Wake Clock: We trained the kids to use the Okay to Wake Clock. I know that some of you are either rolling your eyes at this (because it didn’t work for you), some of you have no idea what this is, and some of you are obsessed with it. It’s basically a clock that you set to turn green when it’s okay for your child to wake up and get out of their bed. You choose the time (like 7am) and it will turn green at that time letting your child know they can get up. If they wake up and the clock isn’t green, they either need to go back to sleep or play quietly until it turns green and then they can get up. WELL. We’ve had this clock for three years and it NEVER worked for Hudson. 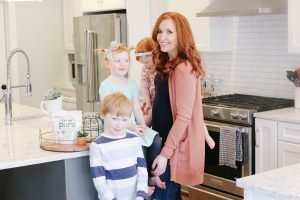 Our good friends have trained their kids to use it and I was shocked. And jealous. Hudson totally ignored the clock and often wasn’t in his room long enough to even see it turn green. So it sat in our closet unused for a few years until I thought we might give it another go. It’s so dark in the morning that the kids have a hard time understanding if it’s the middle of the night or almost time to get up. And OMG. Much to my surprise, it works! So if you are like me and gave up on this clock, try it again in a few months. You might be surprised! Sleep all night in your bed! Do not get up until the clock turns green. I also let Hudson know that it was okay to sleep with Sadie if he was scared. We talked A LOT about these rules and went over them for several days before we tried out the bunk beds. Night One: So……after ALLLL that you are probably wondering, did it work that first night? Well…..no. It was kind of a fail. But it could have been way worse, so I stayed positive! They were pretty excited about sleeping in their bunk bed together, but after I tucked them in at night I watched them on the baby monitor…there was a lot of playing, a lot of Hudson going from his bed to Sadie’s, and a lot of NOT SLEEPING going on. I popped in a few times to remind them of the rules and eventually fell asleep. Around midnight Sadie woke up crying, so I went up there to comfort her. Then, around 3am Hudson had to go to the bathroom, so he came downstairs and got me. I thought for sure he was going to ask to get in my bed but he right away said “okay! I’m going back to bed!” and he did! I was shocked. BUT he got back in bed with Sadie….and woke her up. And girlfriend was UP FOR THE DAY. She just never was able to fall back asleep. Having her brother in her bed was just too much excitement. In her defense, she did pretty well for being her first night in a big kid bed. So we were all pretty tired the next day. And I held my ground and they didn’t get their sleep all night toy nor did they get a star on their sleep chart. But Belle slept all night so she got one. And OH MAN did that make Hudson mad. He could not stand that his little sister had a star and was “winning.” It was actually a GENIUS move that I didn’t intend to make but totally worked in my favor. He was determined to get a star the next night. I posted this photo to my Instagram story….because it was so funny to me how mad they were! Night Two: But you guys, night two (and every night since then) has been a DREAM! They sleep all night! They wait until the clock turns green! (And I set it to turn green later on the weekends!) It’s awesome. They usually sleep separately but sometimes I catch them together in the bottom bed. But really, I don’t care where they sleep just as long as it’s not with me! Routine: So here is our basic routine: Jon is now in charge of Belle’s bath and bedtime routine….and it’s pretty darn cute. It has helped me a lot so I can just focus on the big kids. Once he takes Belle upstairs I play with the big kids for about 20 minutes. Then they shower (together for now) get in to pjs and get a bedtime snack while they watch about 10 minutes of a TV show. Then we brush teeth and hair and head upstairs. We head up earlier than normal because I know there’s a lot of back and forth happening before they fall asleep. And that’s fine by me! I typically sit on Sadie’s bunk and they each get to choose one book for me to read. Sometimes they cuddle next to me while I read, sometimes they get on Hudson’s bed together and look down to watch. Then I turn on ALL THE NIGHT LIGHTS (we love this starry globe light and this multi colored kitty light) and this sound machine that I swear by and have in everyone’s room.) Then I stand on Sadie’s bed and tuck Hudson in and rub his back for about two minutes or so. I totally love this unexpected feature of the full bed on bottom! Then repeat with Sadie. Then they each have one of these cute little lanterns they can turn on and read for a few minutes or play quietly in their bed. I leave and let them do this for about 10 minutes or so. Sometimes when I come back in Sadie is already asleep, sometimes she’s not. Then I tuck them in AGAIN and kiss them goodnight, remind them of the rules, and leave. Some nights I can hear them talking a little or see them moving around on the monitor. And some nights they go straight to sleep. The first week of bunk beds Jon and I kept asking “who are these kids that go to bed easily and sleep all night?” So basically bunk beds were the best thing to ever happen to us. I’m not saying this will work for everyone, but it has worked SO well for us! If you have any questions for me, please leave the in the comments! 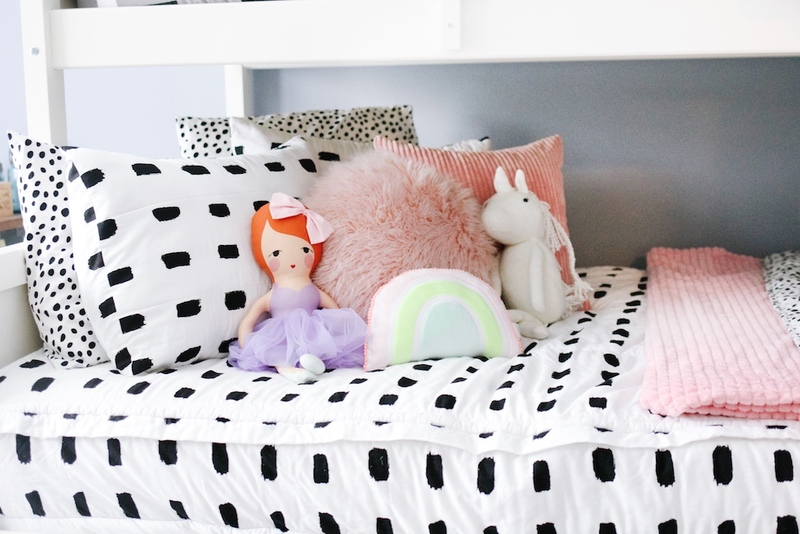 Thank you to Beddy’s for gifting such amazing bedding for this post. *This post contains affiliate links. Thank you for supporting me! You always write the most helpful content. First, you saved our lives with the potty training information and now this! Love the Beddy’s and that room sharing working for both kiddos! Oh my goodness. 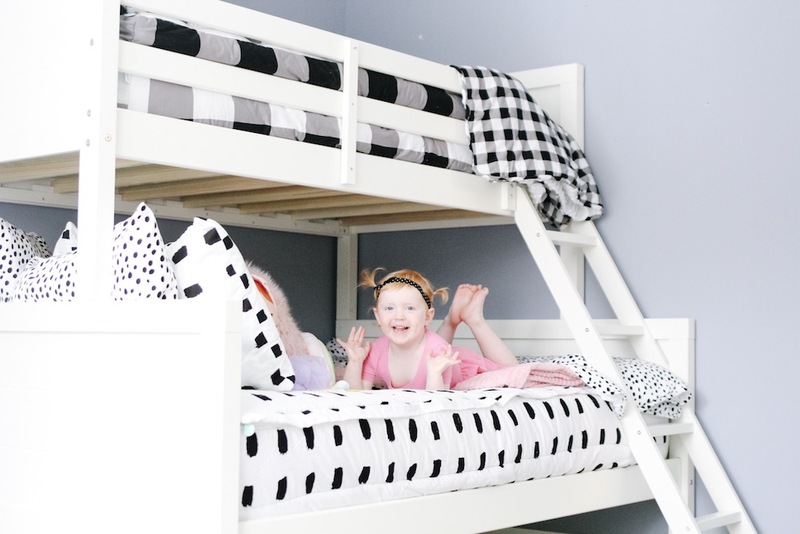 I was seriously JUST searching for twin on top/full on bottom bunkbeds RIGHT before I went to BlogLovin and saw this post! We need to combine our two girls (will be ages 3 and 5) by next summer, and bunk beds popped into my head earlier today. I was so excited to read this post!! So so so incredibly helpful! You were so detailed and it’s truly appreciated! Thrilled this has worked for you. So thankful for bunk beds and kids sleeping through the night!!! Have you had any trouble with Sadie going up to the top bunk? My husband read somewhere that the #1 accident-related death in children under 5 was falling off of bunk beds (who knows if that statistic is truly accurate), so he’s afraid our boys would fall off. 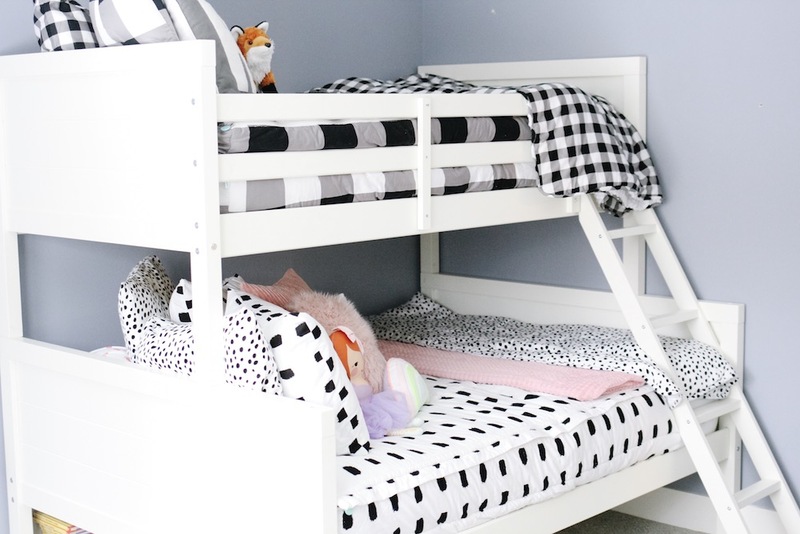 We have 5.5 and 3.5 year old boys, and we tried bunks (when they were 2.5 and 4.5), but eventually separated them. I’m ready to try again, but would love any tips on keeping them from acting like it’s a jungle gym. Thanks!